President Trump's latest executive order is expected to help fill a shortage of 1,500 pilots in the U.S. Air Force. President Trump signed an executive order Friday — and contrary to what your Twitter timeline might have told you, it's probably not a precursor to a declaration of war. 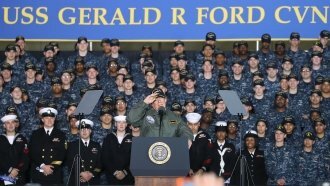 The order effectively lets the secretaries of Defense, Army, Navy and Air Force bring an unlimited number of retired troops back to active duty during wartime or a national emergency. But any new forces the Pentagon conscripts with that authority probably won't end up fighting in a new war — the current wars we're fighting are already short on manpower. Right now, the Air Force is missing about 1,500 of the combat pilots it needs; it's hoping to staff an extra 1,000 pilots from this order. The fight against ISIS in Iraq and Syria has been a particularly heavy burden on the Air Force — it carried out about 86 missions and dropped about 695 munitions on average every month from March to August of this year. The order could theoretically be used by other branches as well — and it's worth noting the Army is hoping to recruit somewhere around 80,000 new soldiers this fiscal year.